Calendula are considered by many gardening experts as one of the most versatile flowers to grow in a garden, especially since they are easy to grow, and tolerate most soils. Like most hardy annuals, it is easy to grow and can be simply sown where it is to flower. It is tolerant of any well-drained soil, even quite poor ones. Cheerful and bright, use Calendula alone or in combination with other flowering annuals and perennials in beds, borders or containers. The tangy petals of are edible. Sprinkle salads and decorate cakes with the petals or feed them to chickens to produce dark coloured yolks. The plants are also an excellent companion plant because of their insect repelling properties. 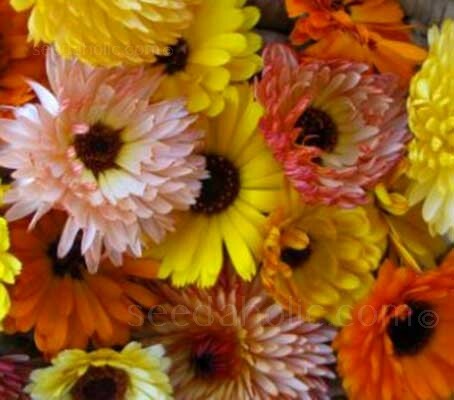 Calendula officinalis 'Cut Flower Mix’ is a specially selected mix of colours and types, each with long stems designed for cutting. They grow to a height of around 70 to 80cm (28 to 32in) and a spread of 45cm (18in), are an excellent variety for borders and make a stunning cut flower. Clip spent flowers to achieve a longer blooming season. Easily sown directly into soil in late summer or early autumn in milder climates. Will do well in moist soil, but requires good drainage. The optimum growing temperature is 18 to 20°C (65 to 70°F). Germination will usually take 14 to 21 days. When transplanting Calendula, try not to damage the taproot. When large enough to handle, transplant seedlings into 7.5cm (3in) pots or trays. Overwinter plants in cool, light, frost-free conditions before planting out the following spring, or grow on as greenhouse pot plants. Sowing to flowering takes about 18 weeks, grow in full sun for best blooms. The flowers are perfect for cutting, pinch out the terminal buds to encourage more flowers. Keeping the plants dead-headed makes them practically perennial. Lift the plants at the end of the year if you want to prevent self seeding, but when they add so much colour who cares! The flowers can be harvested anytime they are in full bloom. If the stem, leaves and flower are to be dried for an arrangement, snip the stem near ground level. If only the flower is to be dried, snip it off from the stem just below its' base. Whole plants and flowers can be easily dried, especially in a dehydrator. Whole plants should be dried separately from the individual flowers as the plants will take much more time to dry. Arrange the plants or flowerheads on a drying rack such they do not touch one another. Once dried, the flower petals will retain their bright colour indefinitely. If only the dried flower petals are desired, remove the petals from the head and store the petals in an airtight container away from bright light. The petals can then be used anytime for culinary purposes or for skincare products. Calendula has a long history as a medicinal herb. Calendula was grown in monastery gardens throughout medieval Europe and was highly valued for its ability to heal wounds. Historically, Calendula flowers have been considered beneficial in reducing inflammation, promoting wound healing and was used as an antiseptic. Externally, the flowers and leaves can be made into an ointment or powder to treat a variety of skin diseases and has been seen effective in treatment of skin ulcerations and eczema. Calendula has been effective in treating juvenile acne and dry psoriasis. Improvement has been seen in as little as 3 to 4 days of treatment according to the Universitatea de Medicina si Farmacie. Try running bath water over a mesh bag full of Calendula flowers for a refreshing and stimulating bath that is good for the skin. For bee stings, rub the fresh flowers directly on the sting to relieve the pain. As a beauty aid, a Calendula rinse made of unsweetened tea brings out the highlights in blonde and brunette hair. The flowers have a pungent, spicy flavour. Only the flowers petals should be eaten as the centre is quite bitter. The petals are used to flavour fish and meat soups, to add flavour and interest to cakes, breads, puddings, egg dishes and salads and in rice as a substitute for saffron. Note - Calendula should not be confused with the African or French Marigolds which are actually members of the Tagetes botanical family. Both the flowers and leaves of the Pot Marigold are edible while those of the African and French marigolds are not. They are an excellent companion plant because of their insect repelling properties. Plant liberally in the vegetable garden to deter pests. Coastal, Flower Arranging, Flowers Borders and Beds, Container Plants. Cut flowers last for about a week in a vase. Calendula flowers can be fed to chickens to produce wonderfully dark-coloured yolks. Marigold blossoms give shades of yellow and wheat, when used as a natural dye. Calendula is probably native to southern Europe though its long history of cultivation makes its precise origin unknown. It is widely naturalised further north in Europe (north to southern England) and elsewhere in warm temperate regions of the world. The genus name originated from the Latin calendae which means 'first day of the month' which was the day proclamations were made and interest on loans collected. When Linnaeus invented the binomial system of nomenclature, he gave the specific name 'officinalis' to plants (and sometimes animals) with an established medicinal, culinary, or other use. The word officinalis is derived from the Latin officina meaning a storeroom (of a monastery) for medicines and necessaries. It literally means 'of or belonging in an officina', and that it was officially recognised as a medicinal herb. It conjures up images of a storeroom where apothecaries and herbalists stored their herbs. The common name is Pot Marigold because the florets were once used as a herbal remedy in broths. In medieval England, Calendula was treated nearly as a vegetable. West or south facing. Exposed or sheltered. 14 to 21 days at 18 to 20°C (65 to 70°F).